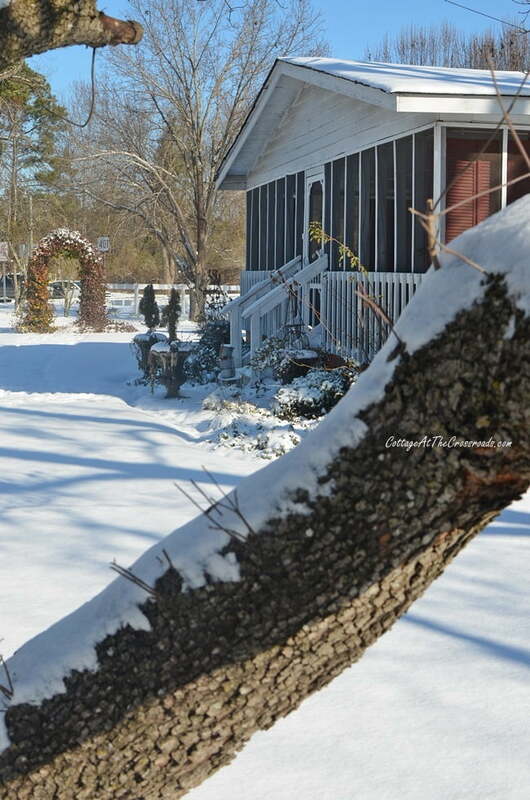 Our Country Cottage in the Snow! 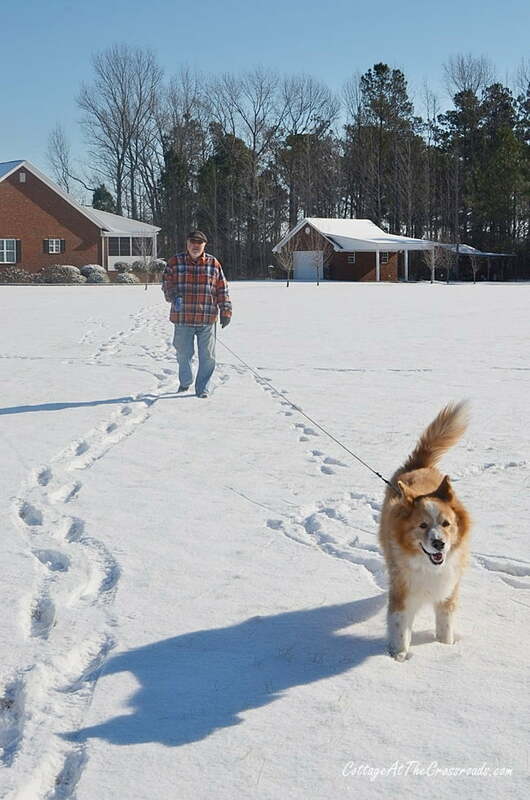 The last time we had this much snow was in January of 2011. I remember that because shortly after we started the blog, I posted about a snowfall that we had. But we have never had snow to hang around as long as this time. It started snowing last Wednesday afternoon, and it continued way into the night. Usually the warm ground temperature causes any snow that we get to turn to mush very quickly, but we have been having record low temps lately. The snow stuck and accumulated very quickly. So the next morning I had to get out and take some photos of nature’s pretty white blanket. Well, today is Saturday and that white blanket is still on the ground in many places which is so unusual. We’ve had beautiful sunny days but the daytime temps have only gotten up to 34 degrees. 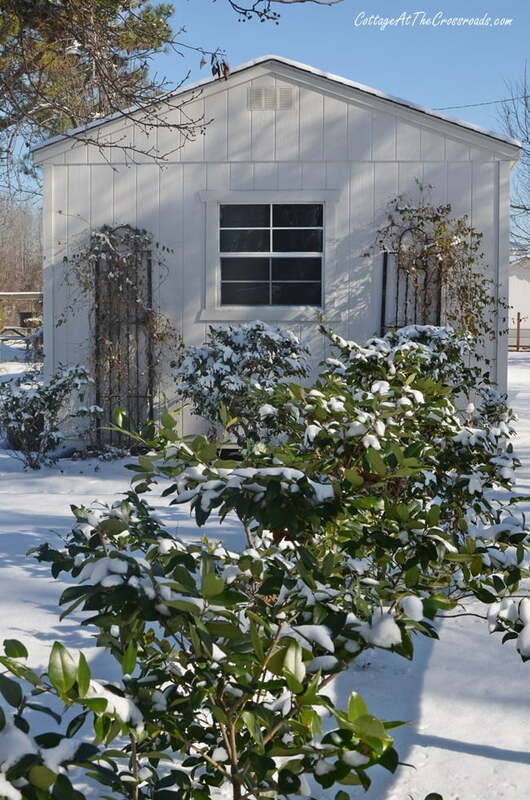 We are not used to this cold weather at all, and I’m not sure how the confederate jasmine on this arbor is going to fare. I’ll have to tell you that I am not a cold weather girl. This long cold spell has practically paralyzed me. I can’t seem to get anything done other than cooking up some hot, comforting food! Most of the Christmas decorations are still on the porch because it’s so cold out there! The snow is so beautiful, though. Lucy loves to romp in the snow. In fact, every time she goes outside, she licks as much snow as she can. 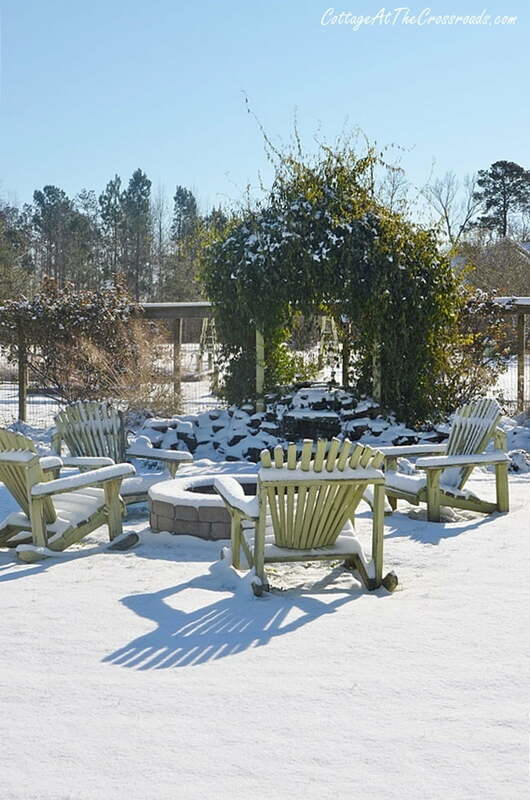 Here is the fire pit and the waterfall covered in snow. And here is the side of our storage building that you rarely see. If you’ve ever wondered where I keep all of our seasonal decor, it’s inside there. I went out into the garden to snap a few pics. 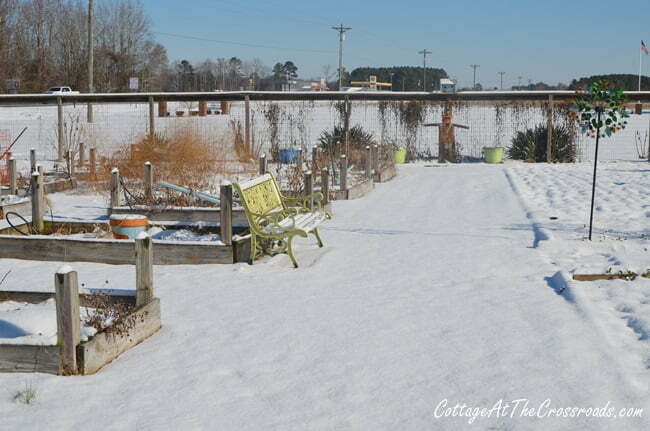 Did you know that snow is actually good for the soil in the garden? It must be all those trace elements that it brings down from the atmosphere. 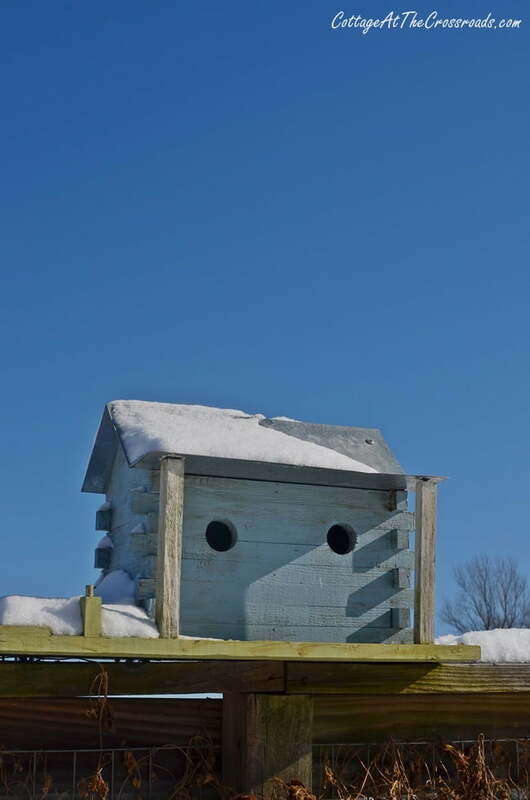 One of the birdhouses has a dusting of snow on its roof. I’m not sure how the succulents growing in the birdbath are going to fare, either! 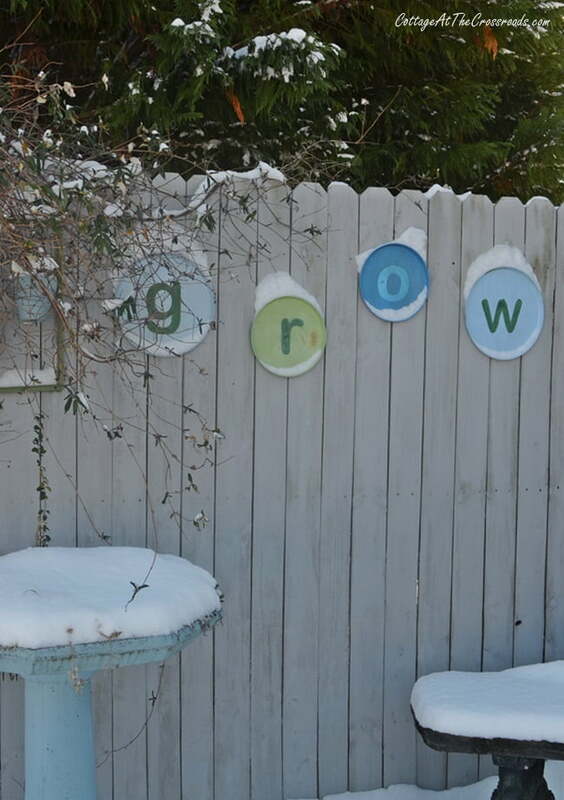 But this whole corner of our garden sure is pretty in the snow. 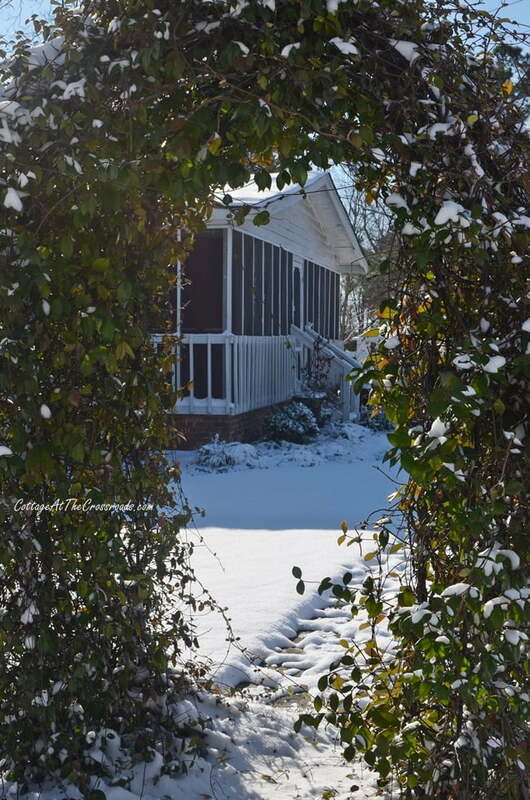 I hope you’ve enjoyed seeing the scenes around our country cottage in the snow. I just love how peaceful and pretty it looks with its white blanket. Beautiful cottage and waterfall covered in snow. These are simply stunning! How creative and beautiful. I love your take on white blanket. 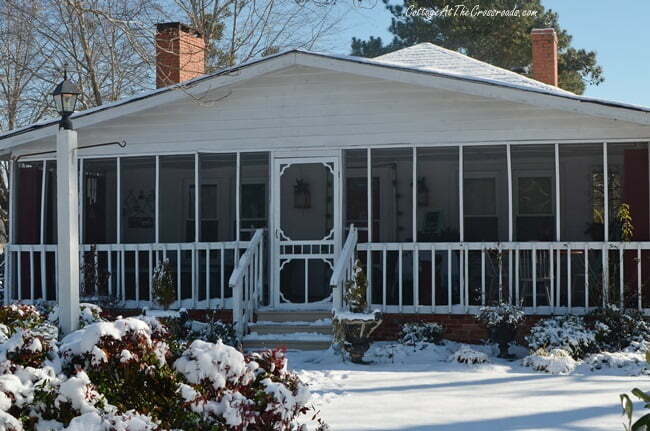 Love your cottage and especially with the beautiful blank of snow! Thanks for sharing! Our snow melted a lot yesterday due to 50 degree temps but still some in shady areas. They say if it sticks around it’s waiting for more to come!!! So pretty. We love when we get a snow storm in Texas too. It’s all lovely. I received my red barn ornament today. I immediately put it under glass with some snow, green trees, and a couple of Dept. 56 people (a snowman and a person on a sled. I love it so much. Thanks. 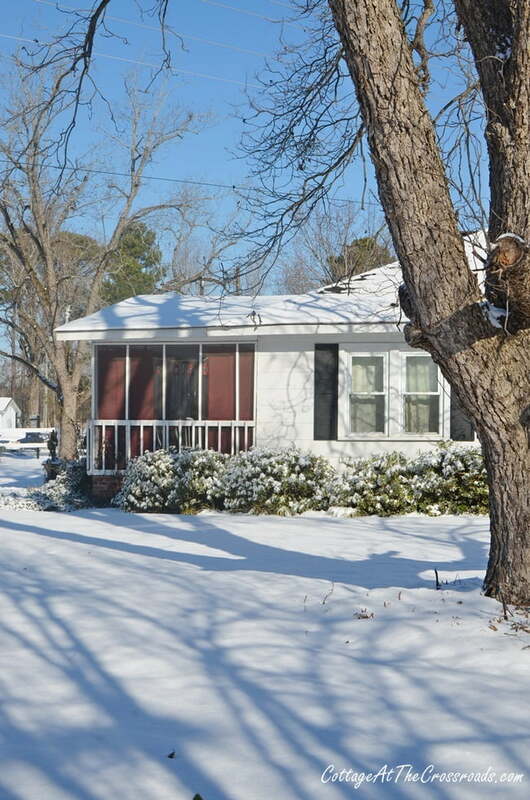 Your home is beautiful in the snow. Great pictures! 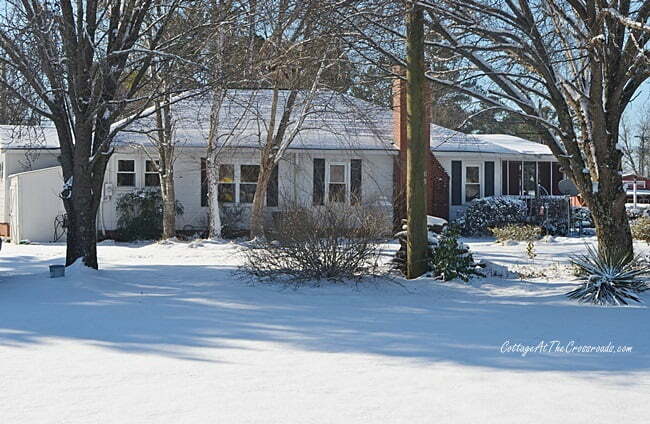 We still have a little snow in spots here in the ‘Low Country’. 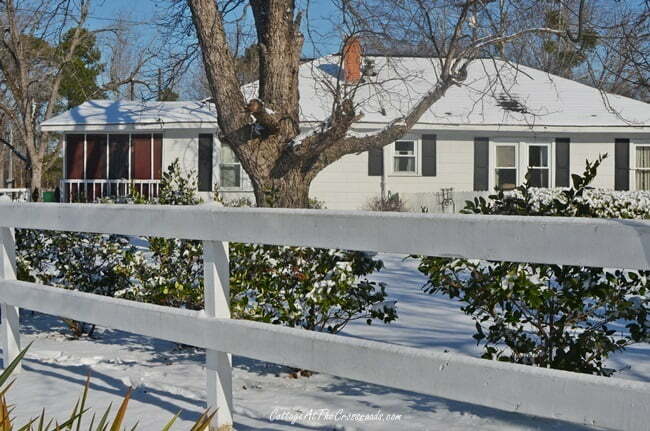 it is cold…but it sure is pretty around there with all that snow. go outside and make a snow angel! Beautiful photos! Living in SC, I get excited on the thought of experiencing snow, but I must say I’m quite ready for warmer weather. It was 8F this morning at my home! Brrr!!! I have lived in the north all of my life but I still marvel every winter at the beauty of the snow. Glad you got to enjoy it too! So beautiful! I love the beauty but it’s too blame cold for us here! My decorations were half down and now standing in the house until it gets warmer over here. Chuck and I have probably gained 20 Lbs…I think we have been doing exactly what you’ve been doing. Just trying to stay warm. Gorgeous pictures, gorgeous home place you have there. Everything is beautiful. I have never seen so much snow down south. I am not a cold weather girl either. I have a new appreciation for our northern neighbors. Those are some hearty folks that can live through months of this. The pictures were fun to view. Your place looks lovely in the snow. I dont know about the Jasmine but the succulents should be ok. I live in Ontario Canada and mine make it through every Winter Season. ???? Well, we have so much of it here in NY that we all chuckle at you Southerners!! I have been snowbound in the house for 3 days and today finally looks clear and sunny – but still very cold with -8′ this morning…brrr Enjoy your “dusting” of snow! !